Meatless Monday is an international campaign that started in Britain in 2009 and has since spread worldwide. The idea behind it is that everyone can make a meaningful change in the world by eating meat-free for one designated day each week. For those who want to get on board with this cause—or who already cook vegan or vegetarian all year round—this collection of meatless recipes will inspire you in the kitchen. Browse these great ideas for breakfasts, lunches, and dinners that leave out the meat, but don't skimp even a little bit on flavor. 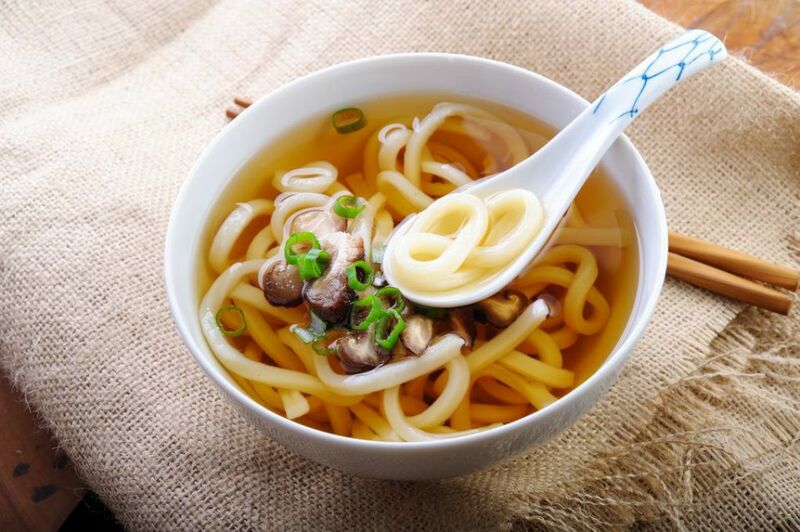 Experience the classic flavors of Japanese-style udon with a vegetable-based soup. The clear broth has a rich umami taste that beautifully balances with the thick chewy noodles, crisp-tender Chinese broccoli, and chopped fresh cilantro, all topped with roasted peanuts. Who needs meat when you can have this cheesy vegetarian casserole? Fried breaded eggplant rounds are layered lasagna-style with tomato sauce and two kinds of cheese, then baked until the whole thing is hot and bubbling. Bonus: the recipe freezes well for a make-ahead meal. Enjoy this easy, cheesy, Tex-Mex burrito that skips meat entirely. Cooked rice seasoned with cilantro and lime juice is loaded into flour tortillas along with sauteed beans and vegetables. Feel free to customize and add your family's favorite burrito fillings. Farro grains and wild mushrooms combine to create a luxurious Italian-style risotto with wild mushrooms, shallot, garlic, butter, and parsley. It makes a filling meatless weeknight meal, along with a side salad. In this insanely delicious gourmet sandwich, soft halloumi cheese is pan-seared until crispy, then layered with roasted, cinnamon-spiked squash, raspberry harissa jam, plus a tangy Brussels sprout slaw. In this light and healthy dish, riced cauliflower florets take the place of potatoes, to form tasty little gnocchi. They are cooked Italian-style with tomato sauce. Top with plenty of Parmesan cheese for serving. Mexican-style soup topped with shredded cheese and corn tortilla strips is a family favorite, especially on colder days. This meatless version with kidney beans and corn uses three jalapeno peppers for plenty of heat, but you can easily dial it down for kids. Meatless Mondays can still be burger days! Veggie burgers made with mushrooms have a flavor and texture that's so meaty, you may not miss the beef at all. Canned pinto beans add protein and texture, while a combination of garlic, onions, cumin, and parsley give it big flavor. 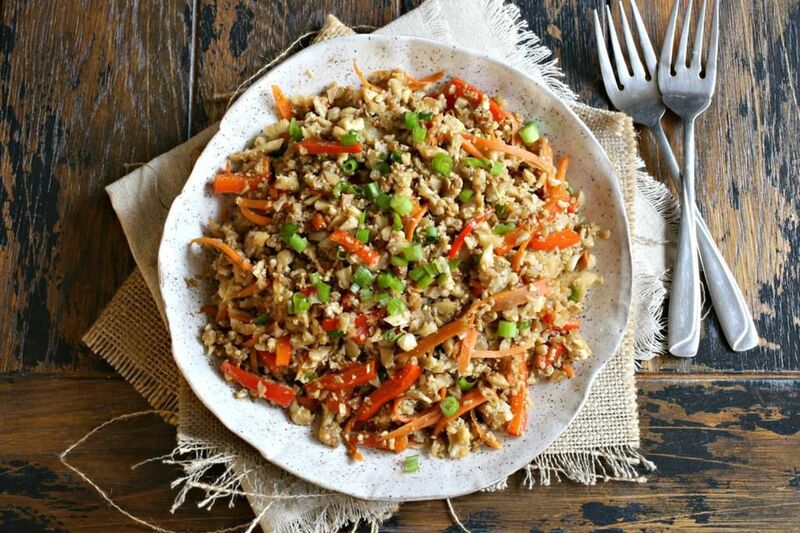 Cauliflower takes the place of the usual white or brown rice in this sneakily healthy stir fry. Cauliflower florets are reduced to rice-sized grains in the food processor, then quickly stir-fried with chopped fresh vegetables and soy sauce. Who wouldn't say yes to peanut sauce for dinner? This Asian-style stir-fry with tofu, shiitake mushrooms, and snow peas is utterly delicious, good for you, and makes a filling meal when served over fluffy hot cooked rice. Sometimes, it's the simple things that satisfy, like this traditional Italian recipe for spaghetti with garlic, olive oil, and a little red chili pepper. Breadcrumbs and parsley are optional, but add lovely texture and flavor to the classic pasta dish. When you're craving something new for dinner, try this homemade flatbread with Middle Eastern inspiration. Naan or pita bread forms the base for the tasty dish, which is topped with crumbled feta cheese, hummus, spinach, tomatoes, and za'atar seasoning. Gluten-free and meatless dinners don't have to be bland! Meaty mushrooms, tangy onions, two kinds of cheese, and jarred tomato sauce deliver plenty of flavor in this family-friendly baked casserole with gluten-free pasta. Even better, it takes just 30 minutes to make. Start your Meatless Monday off right with this on-trend breakfast rich in protein, nutrients, and heart-healthy monounsaturated fat. Whole grain toast is topped with a perfectly poached egg and creamy avocado slices, all drizzled with hot sauce to taste. Soft wheat noodles with stir-fried tofu and vegetables in a medley of Asian sauces makes a filling weeknight meal that is suitable for meat-free days. Roasted cashews add extra crunch and protein to this nutritious vegetable-packed entree. Quinoa is a nutty-tasting grain that packs plenty of protein, making it an excellent choice when you're not eating meat. Here, it's pan-toasted in olive oil with fresh kale leaves, cumin, cinnamon, garlic, and eggs, creating a crunchy, flavorful, and super nutritious side. Every home cook needs to know how to make fettuccine alfredo and this classic recipe is easy enough to whip up on a Monday night, but special enough for dinner parties. Just a handful of ingredients are needed, and while it's not exactly diet food, it's definitely a crowd-pleasing meal. Packaged ravioli forms the base of this creamy pasta bake bulked up with spinach and artichoke hearts. It's done in just 30 minutes and freezes well for a make-ahead meal. Cauliflower and chickpeas are transformed by exotic aromatic spices and other ingredients, including creamy coconut milk, into a delicious vegetarian dish that makes an excellent entree when served over hot cooked rice. Avocado lovers will adore this pasta recipe combining chunks of the creamy, heart-healthy fruit with pesto-dressed noodles. Store-bought pesto is a great shortcut that makes this simple weeknight recipe even faster to prepare. Raw almonds take the place of pine nuts in this Sicilian-style pesto pasta. The nuts are blanched and ground up with garlic, salt, fresh basil leaves, cherry tomatoes, Italian cheese, and olive oil to create a delectable sauce for coating tender noodles. Use up leftover rice and create a tasty dinner the entire family will love with this tropical recipe. Seasoned rice mingle with chunks of juicy pineapple, sweet raisins, roasted cashews, garlic, shallots, soy sauce, and a little curry powder in a fantastic dish you can make in 30 minutes. A fabulous stir-fry sauce is the secret to this meat-free 30-minute dinner. Prep the tofu and all of your veggies first, so you can toss them into the pan at just the right time during cooking. Pumpkin and sage are a classic fall flavor combination. Vegetarian and vegan, this creamy pasta calls for canned pumpkin puree so it's quick and easy enough to prepare any night of the week, but still feels fancy enough for guests. Crockpot lentil soup is inexpensive, packed with protein and fiber, and cooks while you go about your day to form a simple weeknight dinner. Celery and carrots add a sweet note to this filling vegetarian soup. Serve it with salad, and crackers or dinner rolls for a complete meal. Everyone loves pesto pasta and sun dried tomatoes give this colorful variation a fabulous deep red hue and salty-tangy flavor. Serve it with a pasta shape that has ridges to "hold onto" the sauce, such as penne rigate. Thick and luscious cauliflower soup makes a delicious, healthy lunch for meatless Mondays. You'll love the elegant flavors, which come from white wine, garlic, and snipped fresh chives. With less than 10 ingredients, this budget-friendly black bean chili will easily fill up growling stomachs on meatless Mondays. Cook up a big pot on the weekend and freeze individual portions to reheat later for make-ahead lunches and dinners. Enjoy this fresh and satisfying meat-free sandwich for dinner, perhaps with a cup of tomato soup on the side. Thick slabs of soft, fresh mozzarella cheese are tucked between tomato slices and basil leaves inside submarine rolls that are drizzled with balsamic glaze and olive oil. A big plateful of homemade macaroni and cheese makes an indulgent dinner, or a filling lunch. You'll want to bookmark this must-have recipe, which walks you through making a tasty from-scratch cheese sauce. The pasta bake is finished with a tasty, buttered breadcrumb topping.